For Chloe's first birthday, I did a cherry blossom viewing party. 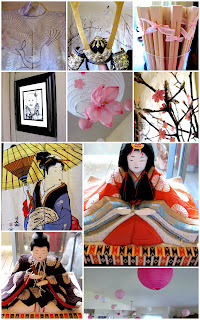 I had been obsessed with a cherry blossom theme ever since I found out I was having a girl. Plus, I was able to make this party pretty affordable since I could borrow a lot of the elements I wanted. I don't think anyone's going to throw a cherry blossom party anytime soon, or if you just want to know how I did some of the things, here's some of the tutorials I used and things that I did for her party. I wanted more traditional Japanese food, but went with what I figured everyone would eat. 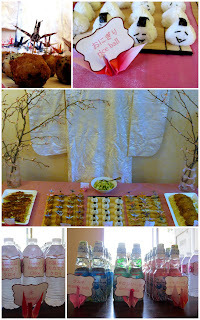 I served pork tonkatsu, teriyaki chicken, rice balls, croquettes, and a cucumber salad. I even bought Japanese sodas for everyone to enjoy. For the decorations, I borrowed a lot of it. My friend lent me her wedding kimono and the curtain, my mom let me use the emperor and empress dolls, and my brother let me borrow his samurai helmet and I also put up the picture that he drew of Chloe on the front door to greet guests with. What I didn't borrow I made or embellished with cherry blossoms that I punched out using a cherry blossom flower punch. I bought pink and white paper lanterns then I used this tutorial from Martha Stewart for the tissue flowers on the lanterns. This might by a bit extreme, but my husband bought me cherry blossom scented oil for Christmas so I even had our apartment scented like cherry blossoms. I decided I wanted to have cranes as part of the decor too, so I used them for the food. I folded small paper cranes for the ends of the toothpicks for the food. (I was going to make curtains of all of the cranes, but ran out of time) I also had regular sized cranes to hold the labels. As part of the display, I wanted cherry blossom branches so I got some branches from a guy pruning his trees and they even had small buds on them which made them perfect! I glued (using tacky glue) on paper cherry blossoms that I punched out. I creased the flowers in the center so they were more 3D; I then used a gold glitter glue stick to dot "stamens" in the centers. I made labels for all of the food and drinks and wrote everything in Japanese with the English translations underneath. To do that I just used Google translator :) For the water bottles I took off the labels and wrapped them with ribbon and glued personalized labels on instead. For the thank you's I put together some Japanese candy (because if you ever get Japanese food they always give you candy with your check) and labelled them as well. I looked up the kanji for Chloe's name and I traced it in fondant. This cake was chocolate cherry cake filled with a lemon custard and frosted with chocolate truffle frosting. This cake was chocolate cake filled with caramel and strawberry buttercream and covered in chocolate ganash. People still dress up in kimonos for cherry blossom viewing parties in Japan and since we bought kimonos for everyone when we were in Japan, plus my family has quite a few extra ones, I thought it would be fun to have as many people dress up as possible. It was so much fun. Everyone really had fun dressing up too. Here's the cute birthday girl in her kimono.